Last night at the Etihad Stadium in the City of Manchester, Barca showed once again that when they lift their game there won't be much the opposition could do about; may be apart from just playing the part. Luis Enrique's boys went in to this match with a bit of self-doubt; or may be the self-doubt was in the mind of the fans. Either way one cannot deny that the defeat at the hands of Malaga at home would have definitely increased the pressure. So to come out and play such emphatically at the stadium of the defending English Premier League Champions was nothing short of magnificent. Two goals from Luis Saurez, someone who was criticized a bit for lack of goals considering the transfer amount; gave Barca a crucial 2-1 victory. The two away goal advantage will count big time as Manchester City need to win the return leg at the Camp Nou at least with a two goal advantage. But still they may fancy their chances and that would be something the Barca team could have done without. We gave them too many life line. After Outplaying them completely in first half, we somehow allowed them to return in to the game and that resulted in Manchester City's sole goal of the match and then that missed penalty from Messi. Had that gone in, Manchester City would be virtually out of the competition by now. A number of the times I have been forced to eat my word, but I have to admit here that it never happened to me this quickly. In my last post (Preview to Manchester City vs Barca clash) I wrote how City have conceded ground to Chelsea and us have gained in their respective title race. Now with Chelsea dropping point in England and Barca losing in Spain, we may most probably go in to midweek game with no difference in domestic situation for these teams. Funny enough if Manchester City win tonight we may go into the midweek clash with momentum on their side. Now that's what we call the classic example of "Eat your Word". This was a great opportunity for Barca, which sorely they missed. Going into the game it was a great chance for Barca to go ahead of Real Madrid (even though it would have been temporarily). Now not only we have missed such a chance but most probably looking at Real Madrid extending the lead to four points. That would place our fate in the hands of Real Madrid once again. Why would I start this article with a quote on Complacency? Because there is no better way to start this discussion in any other way. The sense of confidence this Barca side has been able to instill on us in recent times have raised the belief in the team a lot higher. With such belief comes the danger of complacency. Especially when you are up against a team who could only win one of their last five matches, you are bound to be complacent. Add to this the form of the opposition. The new powerhouse from the city of Manchester has not been in top form in recent matches. 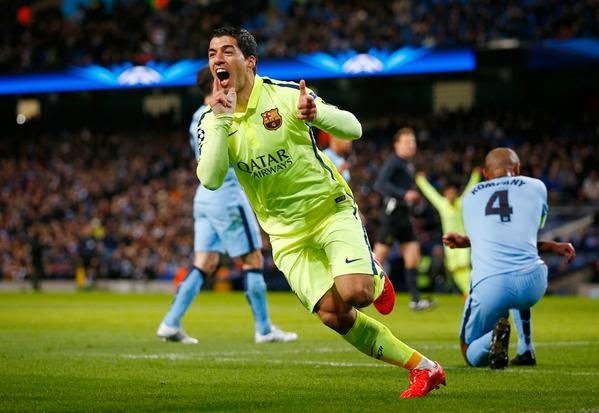 Both Manchester City and Barcelona lie in the second position in their respective league. But the similarity start and end there. FC Barcelona has averted a mid-season crisis (which tend to happen in early January of every year) and clawed their way back into the La Liga title fight big time. Meanwhile Manchester City has seen their gap between them and league leaders Chelsea balooning to a whooping seven points. They are already out of FA Cup and League Cup. In such scenario it is natural to bet against Manchester City, but then this game is called the "Game of Glorious Uncertainty" for nothing. So reserve your FC Barcelona vs Manchester City Champions League Tickets today itself from our partner 1st4FootballTickets. FC Barcelona took a huge step to yet another Copa del Rey final with a very well fought 3-1 victory against Villareal. The Yellow submarine who has been in some sensational form recently found themselves at the end of an onslaught from Barca at the Camp Nou. To their credit their tactics was completely different from the team which played against us recently. The idea was to get away from Camp Nou with minimum damage. But Barca boys had completely different plans. Lionel Messi opened the scoring from a delightful Saurez assist, followed by Iniesta and Pique. The only goal for Villareal came from a huge mistake from Barca goal keeper Ter Stegan. To be fair, it is hard to criticize him. He gets very less playing time. May be Enrique needs to immediately decide how he is going to give more playing time to him. Warming up on the bench for most of the time will not help him nor us, especially in Champions League. Luis Enrique and his boys were not going to let it happen once again. The last time they saw the League leaders Real Madrid drop points, they returned the favour by losing their match also. Luis Enrique had to receive a fair share of criticism for the strategy employed in that match against Celta at the Camp Nou. But everyone knew that he wasn't going to take any chance this time around. The result, a convincing 5-2 victory against Athletic Bilbao at one of the most difficult stadium in La Liga, especially for Barca. A visit to San Mames does not make Barca fans comfortable, actually it throws them around emotionally. This time around there was no such thing. The team was clinical from the start. When Athletic Bilbao started to make a match of the game, the team responded immediately shutting them down and retaining a bigger lead. With this victory Barca has closed down the lead on top to just one point. Real Madrid may still be on top of the league, but Barca very much have their destiny in their own hands. Highlights from Barca's 3-2 victory against Villareal which helped them stay close to leaders Real madrid and ahead of defending Champions Atletico Madrid. Something strange is happening nowadays with Messi this season. 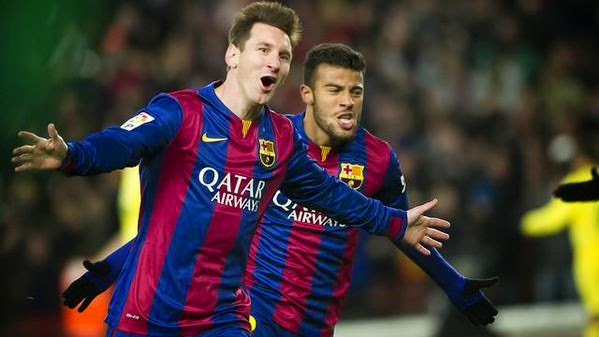 Messi has been scoring so many goals with his weaker right foot this season. Yesternight he raised that one notch up by scoring a sensational Golazo with his right foot.